Wood, Frank Watson (1862-1953). Watercolour signed and dated 1918. The battleship HMS MARLBOROUGH (Captain George Ross RN) was flagship of Vice Admiral Sir Cecil Burney KCB KCMG, Vice Admiral Commanding First Battle Squadron, at the Battle of Jutland in May 1916. 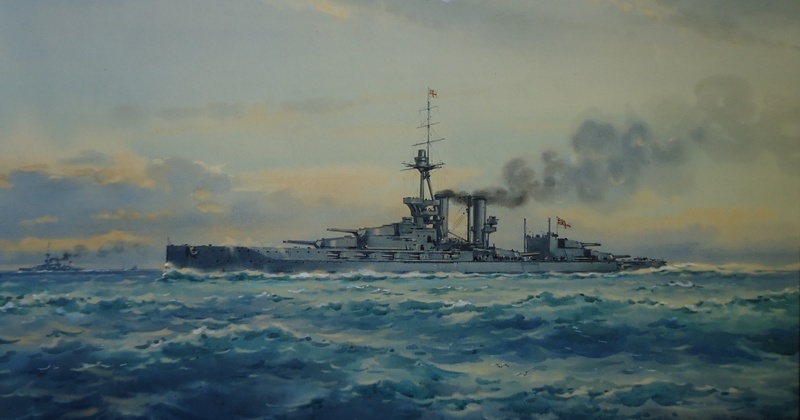 Made up of HM Ships MARLBOROUGH, REVENGE, HERCULES, AGINCOURT, COLOSSUS, COLLINGWOOD, NEPTUNE and St VINCENT the 1st BS was a mixture of several battleship classes, some, like REVENGE, brand new, others such as COLLINGWOOD and St VINCENT, rather older second generation dreadnoughts. Ironically the only ship of the 1st BS to receive more than minor damage during the action was the flagship herself who, at 1845 on the evening of the battle, altered course to avoid what s reported as an incoming torpedo. Hard manoeuvring was unsucessful and the torpedo struck under the bridge on the starboard side causing immediate flooding and two deaths and an 8 degree list to starboard. Captain Ross managed, however, to maintain 17 knots and his position in the line and the ship was involved in several fierce skirmishes with German capital ships and TBDs during the early part of the night. But by the Middle Watch on 1st June the battleship was in trouble: her attempts to stay in the line and maintain 17 knots were causing problems down below where there had been significant structural damage. At 0230 it was becoming just too much for the bulkhead in A boiler room and Captain Ross reluctantly reduced speed to 11 knots thereby requiring her to fall out of line: the destroyer FEARLESS (Captain Charles Roper RN, Capt D(1)) was summoned alongside and the admiral and his staff transferred to her and then to the battleship REVENGE (Captain Edward Kiddle RN). FEARLESS then returned to MARLBOROUGH and with 4 other TBDs escorted the wounded and vulnerable battleship on her slow haul back to Rosyth. During the night of 1st/2nd June, however, the weather deteriorated and the increasing sea added further to Captain Ross' worries about the watertight integrity of his ship as further bulkheads started to strain: he altered his destination from Rosyth to the nearer Flamborough Head and the River Humber. Eight additional escorts and a salvage tug were ordered to close MARLBOROUGH with despatch and after sporadic submarine attacks she arrived safely in the Humber at 0800 on the 2nd June. After the war MARLBOROUGH joined the Mediterranean Fleet where she remained until 1926; she then joined the Atlantic Fleet but was paid off and then scrapped in 1932, victim of the Washington Treaty.